Berkeley, Calif. – Nov. 7, 2017 – The RISC-V Foundation, a non-profit corporation controlled by its members to drive the adoption and implementation of the open, free RISC-V instruction set architecture (ISA) forward, today announced that the Foundation’s membership has exceeded more than 100 organizations, individuals, academics and universities from 19 countries and six continents around the world. Since its inception in 2015, RISC-V has quickly evolved its ecosystem to feature established technology giants and emerging startups all working together to enable a wide range of open-source and proprietary RISC-V hardware and software solutions. This milestone marks a more than 120 percent year-over-year membership growth since November 2016. RISC-V is the first to offer an alternative to the existing closed and costly ISAs. It’s because of this freedom that the RISC-V ecosystem continues to rapidly grow, empowering startups and enterprises to innovate quickly without expensive and timely contract negotiations from proprietary ISA suppliers. As a result, members are solving some of today’s most complex design challenges including security, performance, power, efficiency, flexibility and more. RISC-V members are located across six continents, with members representing countries including the United States, Canada, Germany, India, Taiwan and the United Kingdom, among others. Platinum members include Bluespec, Cortus, C-SKY, Google, Huawei, Micron, Microsemi, NVIDIA, NXP, Qualcomm, Rambus, Samsung, SiFive, UC Berkeley and Western Digital Corporation. To become a member today, visit: https://riscv.org/membership-application/. 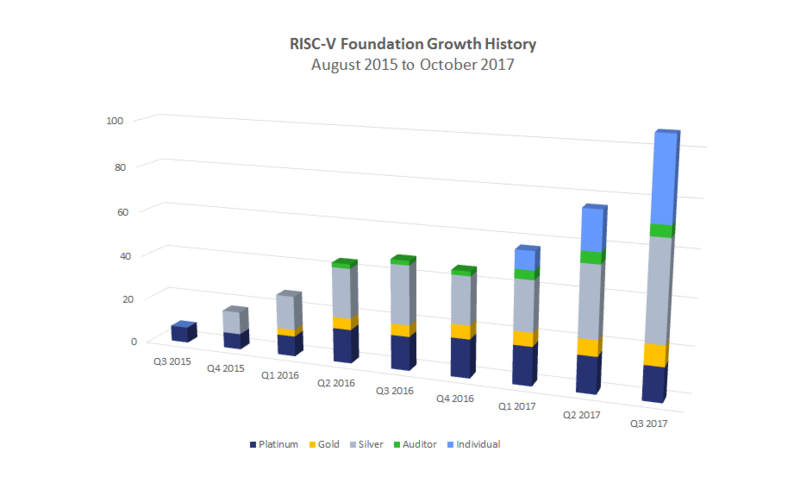 “RISC-V is in my DNA and the recent success of its membership is a great achievement and a proof point of RISC-V’s long-term market implications. This is only the beginning for the ecosystem,” said Dave Patterson, Researcher at Google. “The reason we’re witnessing continued success with RISC-V is because it’s a free and open ISA developed by the community. This openness allows us to harness some of industry and academia’s most brilliant minds to help improve the architecture, and also frees implementors to develop efficient open-source hardware designs for new cutting-edge applications. Quality, flexibility, low cost, but above all the community, are what set RISC-V apart from proprietary ISAs,” said Krste Asanović, Professor at the University of California, Berkeley.